I wish I had a few things finished but at least there is progress and I have all day to sew! 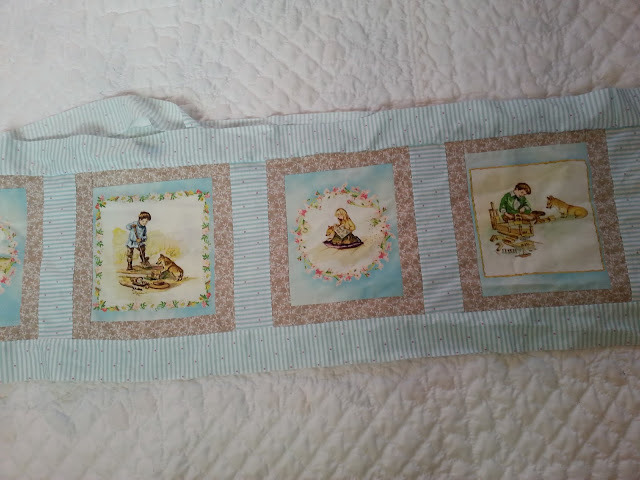 Here is the start of a crib bumper that is for my first little grandchild coming next month. It's made from a panel called A Child's Garden of Verses. I'll show you this later in Teddy's white crib. 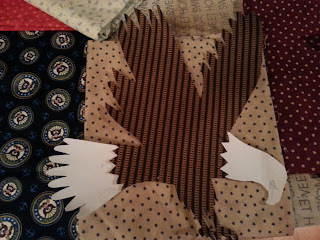 My coworker, Katherine will be honored in March and I'm working on a retirement quilt for her. 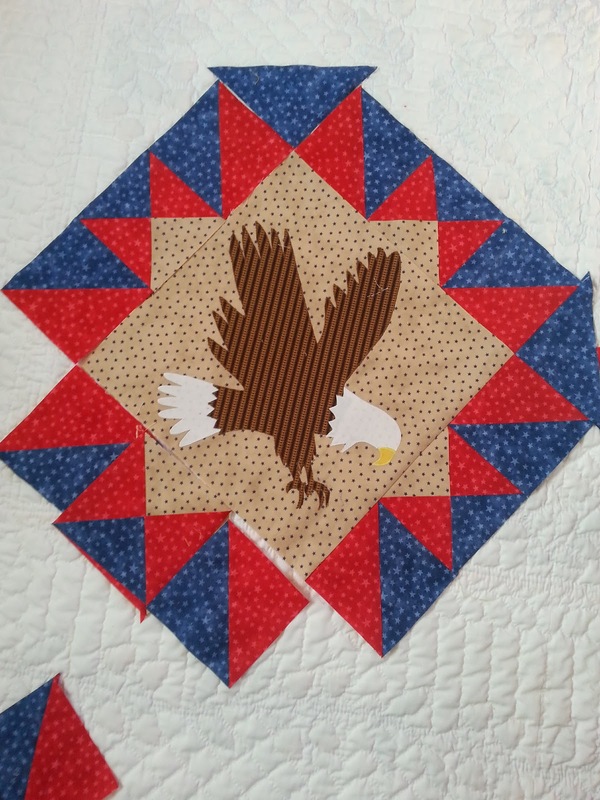 I've chosen a patriotic theme for her quilt as she and her husband are patriots! 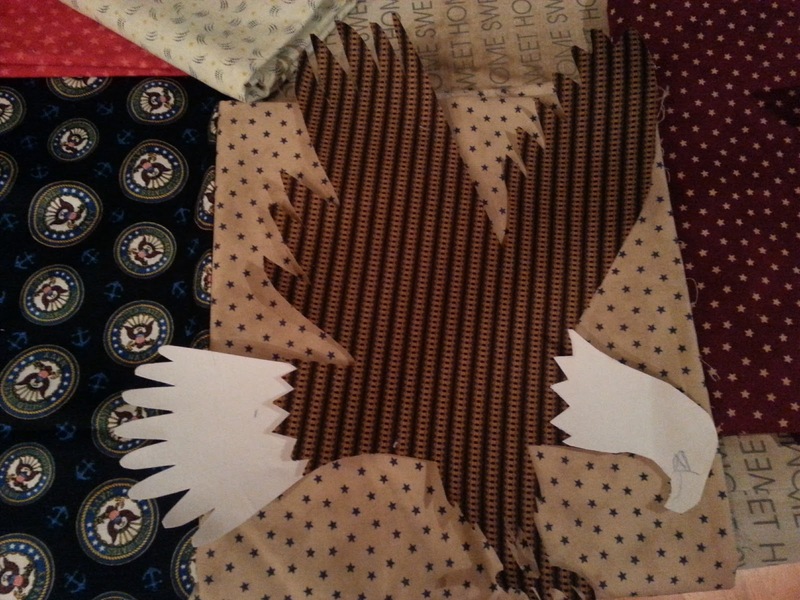 Here's an eagle I sketched out on heat and bond and ironed onto fabric. Now to choose a back ground fabric to applique it on. 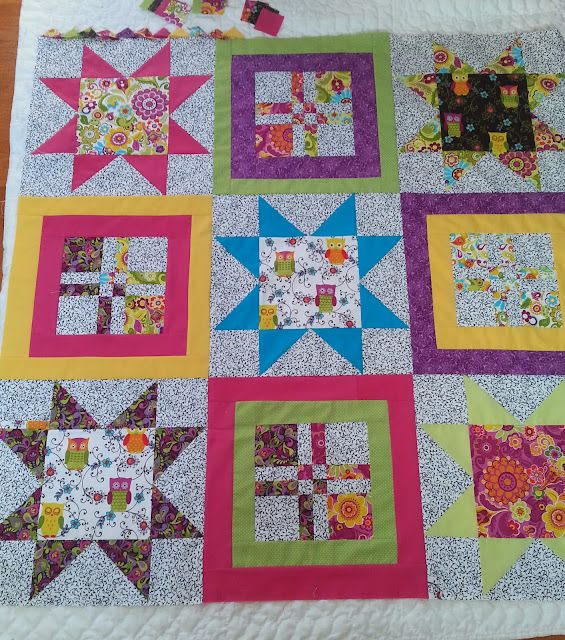 I am making a version of this quilt I saw on Amish Country Quilts. Here is a bit of progress. I'll include some cutting instructions in a future post. Lastly another coworker is having a baby girl, due the same time as my little grandson. My manager usually makes baby quilts and retirement quilts for my coworkers but her sewing foot is broken so luckily I can help out. She had a UFO-- some 12 disappearing 4 patches (DFPs) blocks and gave them to me along with the left over layer cake she made them from. I decided to make star blocks but couldn't incorporate the all the DFPs so bordered for of them and each block is 15" and so the quilt will be approximately 43" square. Aren't the little owl's cute? To finish it off I'm going to make a prairie point border from 2" squares. 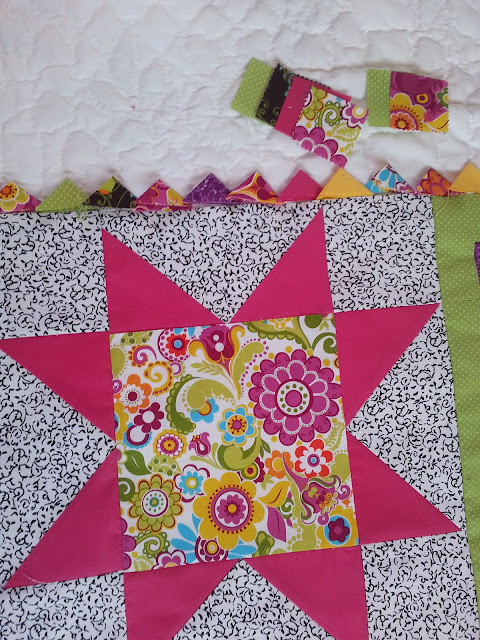 I hope the prairie points will bring all the bright colors together and flatter the stars! Unfortunately, crib bumpers are not recommended and should not be used in baby cribs. Lovely works in progress! You won't have time to be bored! Congratulations on the coming grand child! !